SUDAN. Panyagor. May 2000. Cattle camp. An outbreak of foot and mouth disease affected the precious cattle of the Dinka tribe in South Sudan. Cattle camp. An outbreak of foot and mouth disease affected the precious cattle of the Dinka tribe in South Sudan. May 2000. Village life is difficult in the arid region of Bor County. Panyagor, Sudan. May 2000. CONGO - DRC. Kinshasa. October, 2002. Portraits from a street kid gang in central Kinshasa. SIERRA LEONE. Freetown. October, 2000. Warblind patient awaiting surgery. 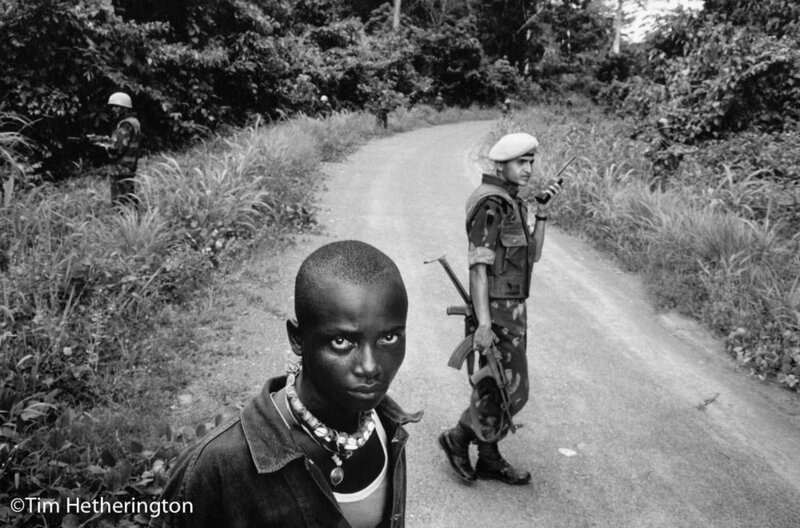 A large number of people lost eyes during the civil war in Sierra Leone, either through gunshot, shrapnel, or rebel torture. SIERRA LEONE. Freetown. December, 2001. Portraits of pupils at the Mitlon Margai School for the Blind. SIERRA LEONE. Freetown. December, 2001. Abu Koroma. Portraits of pupils at the Mitlon Margai School for the Blind. SIERRA LEONE. Freetown. December, 2001. John has his haircut. Milton Margai School for the Blind. SIERRA LEONE. Freetown. December, 2001. Braiding hair in the girls dormitory. Milton Margai School for the Blind. SIERRA LEONE. Freetown. December, 2001. Mohammad Kab'bah keeps the key for the school's food store around his neck. Milton Margai School for the Blind. SIERRA LEONE. Freetown. May, 2002. A patient at the Kissy mental hospital where people sufffering from mental health problems are sectioned for care. SIERRA LEONE. Freetown. May, 2002. Rioting breaks out downtown between SLPP and RUF party loyalists. People wait away from the rioting that occurred between supporters loyal to the SLPP and those from the ex-rebel group RUF during the last day of campaigning for the post-war elections in Sierra Leone. May 2002. Young fishermen push their boat off. Bunce Island was once on the prosperous slaving route whereby slaves were taken down the coast of west Africa and across to the West Indies. Freetown estuary, Sierra Leone. October 2003. SIERRA LEONE. Bo. October 1999. Children come to a clinic to have their eyes tested. Many people developed eye problems during the civil war because access to healthcare became too difficult. 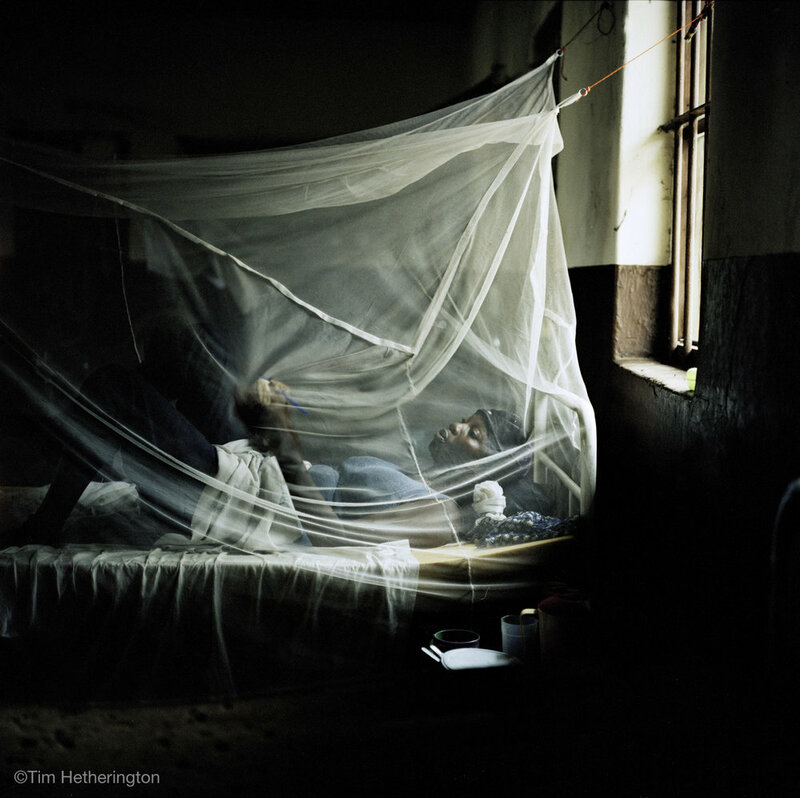 During a ceasefire in 1999, Bo hospital opened up a clinic to treat those who were suffering from such conditions. SIERRA LEONE. Bo. October 1999. Many people developed eye problems during the cicl war because access to healthcare became too difficult. During a ceasefire in 1999, Bo hospital opened up a clinic to treat those who were suffering from such conditions. SIERRA LEONE. Bo. October 1999.Children from the Milton Margia school for the blind share a meal in the school dining room. SIERRA LEONE. Bo. October 1999.A man at an internally displaced people's camp on the outskirts of Bo comes to have his eyes tested during a visit of an eye specialist to the camp. Many had not had access to any kinds of doctors because of the instability caused by the war. SIERRA LEONE. Freetown. October 1999. 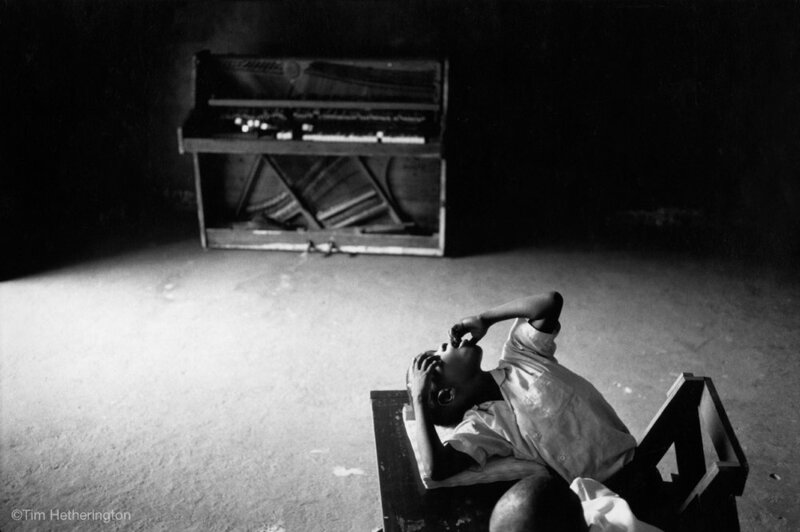 Boy in classroom at the Milton Margai School for the Blind. Boy at gates to the National Stadium, Freetown, Sierra Leone. During the rebel invasion of the city in 1999, tens of thousnads of people fled to the stadium seeking sanctuary from the slaughter that resulted. Many of the disaplaced continued to live in the stadium after the rebels were evicted frm the city. Despite the stadium being turned into a displaced camp, sports continued to flourish. Freetown, Sierra Leone. December 1999. Athletes train outside the front of the Siaka Stevens Stadium. The Siaka Stevens Stadium became the refuge for many people seeking safety from the civil war. Much of the stadium lay in disrepair when 40,000 sought shelter during the intense fighting of January 1999. Despite the fact that the stadium was sheletring many refugees from the war, sports activity continued to take place. Freetown, Sierra Leone. Decmber 1999. A band prepares to play during a peace rally at the National Stadium, Freetown, Sierra Leone. During the rebel invasion of the city in 1999, tens of thousands of people fled to the stadium seeking sanctuary from the slaughter that resulted. Many of the disaplaced continued to live in the stadium after the rebels were evicted frm the city. Despite the stadium being turned into a displaced camp, sports continued to flourish. Freetown, Sierra Leone. December 1999. A local guide and members of the UN Indian battalion on patrol in an area controlled by rebel group the Revolutionary United Front (RUF). A soldier reads a letter from home. During the UN military operation following the end of the Sierra Leonean civil war (UNAMSIL) saw Indian peacekeepers deployed in the far east of the country in the town of Daru. For many, the assignment meant keeping on with the routines of their own culture in this foreign land. Daru, Sierra Leone. August 2000. George Mureu, the coach of the National Kenyan Taekwondo team, runs a Taekwondo academy for young people, most of whom come from the streets or from disadvantaged backgrounds. ANGOLA. Luanda. 2002. Photographs of people who have gone missing during the course of the Angolan civil war are brought by friends and loved ones to Independence square in Luanda in the hope that someone may know where they are. LIBERIA. 2003. Local artists bring a picture they have painted of the chairman of the rebel group Liberians United for Reconciliation and Democracy (LURD), Sekou Conneh, to his hill top residence in Tubmanburg. LIBERIA. Monrovia. February 2004. Children living in the derelict Housing and Savings Pension Bank live in crowded and dirty conditions. The defunct bank in downtown Monrovia was squatted by many Taylor-loyalist fighters and their families. The proposed building was never finished after it ran out of money under the tenure of Igantius Clay. LIBERIA. Monrovia. May 2004. Matren Ondraka from the Czec Republic trains new recruits to the Liberian National Police (LNP) in riot control as part of the United Nations Civilian Police (CIVPOL) restructuring plan. LIBERIA. Monrovia. May 2004. A member of the Liberian National Police (LNP) Task Force stands outside the Star hotel where police and UN CIVPOL units had attempted to track down a man wanted on charges of murder. LIBERIA. Monrovia. May 2004. Ex-combatant poses for an outside studio portrait on Broad street. The boy was recruited to fight for Charles Taylors forces. He was caught during the fighting by LURD rebel forces, who cut his hands off and sent him back to Monrovia. LIBERIA. Monrovia. May 2004. Broad street life, near the corner on Randell street where the street photographers gather to ply their trade outside of a Souvenir Photo store. IVORY COAST. Bouake. October, 2002. Liberian prisoner freed by rebels from central prison in Bouake. Mnay congregated at the local mental asylum. This picture was taken during the the rebel insurgency which began with an uprising on September 19th 2002 by army mutineers. IVORY COAST. Bouake. October, 2002. Liberian prisoners released from the central prison congregated at the local mental asylum to seek somewhere afe to stay. This picture was taken during the the rebel insurgency which began with an uprising on September 19th 2002 by army mutineers. LIBERIA. Monrovia. May 1999. Practicing headers. Many young men in Liberia are drawn to football. Despite the social breakdown that transpired during the war, football has always remained an important way to bring the youth together. In 1999, a football team called the 'Millenium Stars', comprised predominantly of ex-combatants, travelled from Liberia to the UK. LIBERIA. Monrovia. May 1999. Young street kids play football in a derelict builing in downtown Monrovia. Many young men in Liberia are drawn to football. Despite the social breakdown that transpired during the war, football has always remained an important way to bring the youth together. In 1999, a football team called the 'Millenium Stars', comprised predominantly of ex-combatants, travelled from Liberia to the UK. LIBERIA. Monrovia. 1999. A member of local football team 'Millenium Stars' stretches before a practice match. LIBERIA. Monrovia. 1999. Members of local football team 'Millenium Stars' gather at a communal house. LIBERIA. Monrovia. May 1999. An under 13 competition held in downtown Monrovia sees a large crowd gather to wacth. Many young men in Liberia are drawn to football. Despite the social breakdown that transpired during the war, football has always remained an important way to bring the youth together. In 1999, a football team called the 'Millenium Stars', comprised predominantly of ex-combatants, travelled from Liberia to the UK. LIBERIA. Monrovia. May 1999. Food vendors gather before the start of an Under 13 competition. Many young men in Liberia are drawn to football. Despite the social breakdown that transpired during the war, football has always remained an important way to bring the youth together. In 1999, a football team called the 'Millenium Stars', comprised predominantly of ex-combatants, travelled from Liberia to the UK. LIBERIA. Monrovia. 1999. Kids play during half time break of a street-kid football match in downtown Monrovia. LIBERIA. Monrovia. 1999. A local artist's studio in downtown Monrovia. Outside sits a painting of football legend George Weah. LIBERIA. Monrovia. May 1999. Young boy with football in downtown Monrovia. LIBERIA. Monrovia. May 1999. Young men kick around a football on Popo Beach in Duala. Many young men in Liberia are drawn to football. Despite the social breakdown that transpired during the war, football has always remained an important way to bring the youth together. In 1999, a football team called the 'Millenium Stars', comprised predominantly of ex-combatants, travelled from Liberia to the UK. ANGOLA. Luena. June 2002. Amputees line up prior to a football match organized by an American veteran's NGO that focuses on rehabilitating those injured from the war. Both sides in the Angolan civil war used mines which have resulted in tens of thousands loosing limbs to this day. Fokaph Sumo and other member of the Millenium Stars put on their new football boots before taking to the training field during theit tour of the UK. Durham, UK. September 1999. A member of George Mureu's taekwondo squad trains at the National gym. George has devoted himself to the training of a group of ex-street kids in the art of taekwondo. His squad is itself drawn from young men who have grown up on the streets of Nairobi, and who he helps to rehabilitate by using the sport as a form of discipline to break their street habits. Nairobi, Kenya. February 2002. A Soviet era 'Welcome' monument on the edge of the town of Kulyuba Oblast depicts Tajikistan as a lush and well irrigated country, October 2001. Under Stalin, a huge irrigation programme was implemented to divert the abundant river resources of Tajikistan in order to irrigate the cotton and wheat fields. 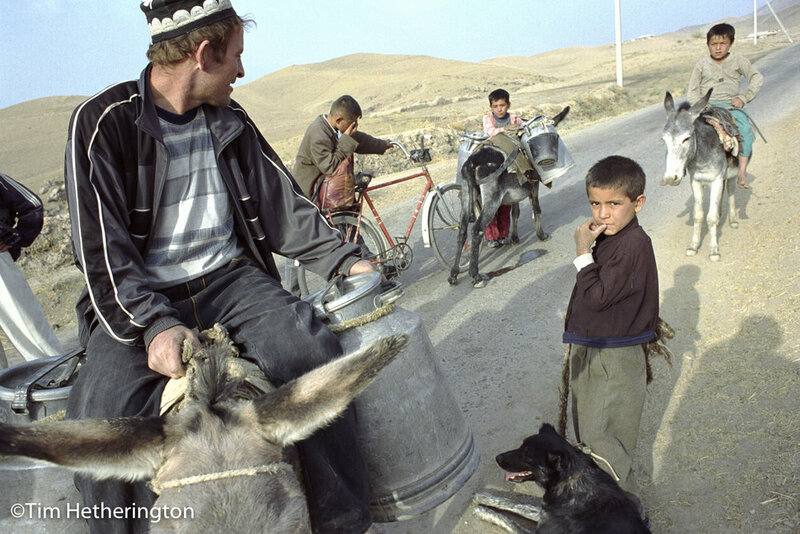 Villagers travel by donkey and bike from the remote village of Obyoshi (meaning "Beloved of Water") to the nearest water source located 5kms away. The infrastructure of the Soviet era irrigation system has broken down, leaving arid fields and water shortages. People make the trek at least twice a day to collect fresh water. Kurgan Tube region, October 2001.